File contains correspondence with V.S. Kaduskar, Barbara Kwiatkowska (with a copy of her article "States' Responsibility for Pollution Damage"), O. Knacke, [Robert ? ], and K. Kurokochi. 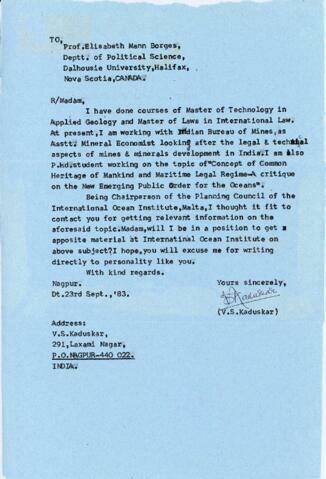 For more correspondence with Barbara Kwiatkowska regarding International Ocean Institute (IOI) activities, MS-2-744, Box 279, Folder 4. Certain pages from this file have been removed from the digital object. The complete contents of this file must be viewed on-site in the Archives and Special Collections Reading Room.